Investing in securities is risky enough without worrying about whether your salesperson is going to fleece you. To be an informed investor, you must know what danger signs to look for. Some are subtle, and some are easier to spot. Select an item below to read more information about that topic. Rule 7: Don't be afraid to "sleep on it." 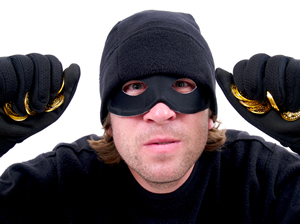 Rule 1: Con Artists Like To Blend In Con artists know that being themselves hurts business. Effective con artists must disguise their true motives. Whether your first contact with the con artist is through an unsolicited telephone call or a stranger ringing your doorbell or sending you an email, the con artist takes great pains to look and sound familiar. Often, con artists like to blend in with others in your group whether that group be political, community (such as the local senior center), religious or other. They quickly get to know a lot of people in the group so they can count on this common bond to spread the word about their questionable investments and reel in unsuspecting investors. Rule 2: Con Artists Dress For Success Even though con artists would like you to believe that they are "just plain folk," they are smart enough to realize that this alone will not sway you to part with your money. They work very hard to come across as smooth, professional and successful. Con artists may dress like they are wealthy and work out of impressive looking offices. If your only contact is by mail, the office may bear a prestigious sounding address. Often, this is nothing more than a mail drop. Your best bet is to look behind the surface and do some serious investigating before you part with your money. Rule 3: Con Artists Often Push Poorly Understood or Little-Known Products Today, a variety of institutions, from banks to brokerage firms to financial planners, offer a wide range of financial products. With such a confusing mix to choose from, it is no wonder that many people turn to financial advisers for guidance. Con artists know this and stand ready to assume full responsibility for your investment decisions. Don't let them! When it comes to your money, think things through for yourself after getting all the facts. Never give someone control over your purse strings just because you think you are too old, young or financially inexperienced. If you really need help, only deal with financial advisers, broker-dealers or financial institutions with proven track records. Rule 4: Con Artists Bring Out The Worst In You Skilled con artists can bring out your worst traits, particularly greed, fear, and insecurity. Con artists know that promises of huge returns with no risk will get your attention. They hope that it will get your money too. Fear comes into play when the con artist warns you that complaining about a failed investment to the government may result in your spoiling it for others or "rocking the boat." Con artists try to make you feel inadequate if you don't believe them or ask too many questions. If you find yourself making investment-related decisions based only on your emotions, watch out! Rule 5: Con Artists Are Fair Weather Friends Before you invest, con artists are very friendly. They take a personal interest in you out of the blue. They call back when they promised they would. Each time, they tell you even more good things about the investment. You may feel you're being pressured into investing. You are. Despite his or her kind words, the con artist will do anything in his or her power to make a sale. Too often, however, once you have invested your money, contact with the con artist dwindles and then stops altogether. If you cannot get answers to your questions after handing over your cash, there is a good chance someone else is getting rich off of your investment. "Your return is guaranteed. There's no way you can lose money." "If this doesn't perform as I just said, we'll refund your money no questions asked." In addition, be wary if the salesperson doesn't ask you questions about your past investment experience and your ability to withstand risk. Even if the salesperson does ask a few related questions, take heed if you get the sense that he or she is merely going through the motions. Rule 7: Don't be afraid to "sleep on it." If you are promised high, guaranteed profits and given no written explanation concerning the investment vehicle, the promoter's background or the risks involved, walk away. Never invest in anything based on the enthusiasm or charisma of the salesperson - they may have more to gain by taking your money than you know.